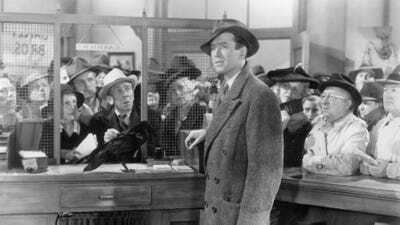 The typical person probably thinks about a bank the way it’s depicted in the movie It’s A Wonderful Life. In the scene below, George Bailey’s savings and loan is being caught up in a run on the banks. Bailey is forced to explain to the depositors that their money isn’t in the vaults because it’s been loaned out. He then points to some people in the crowd who have taken out mortgages from the bank, explaining how that’s where people’s deposits have gone. But actually that’s not how banks work. The reality is that banks don’t make loans out of existing deposits. When a bank gives you a mortgage (or any other loan) it doesn’t go into its vaults to see if there’s cash available that someone else has deposited. Instead, the bank digitally (almost like magic) credits your account with the amount you need to pay for the home. Essentially, modern banking represents the outsourcing of money creation from the Federal Government to the banking system. Of course, there are limits on how much money banks can create (some of the limits stem from regulation, some stem from monetary policy, and some stem from the market itself). 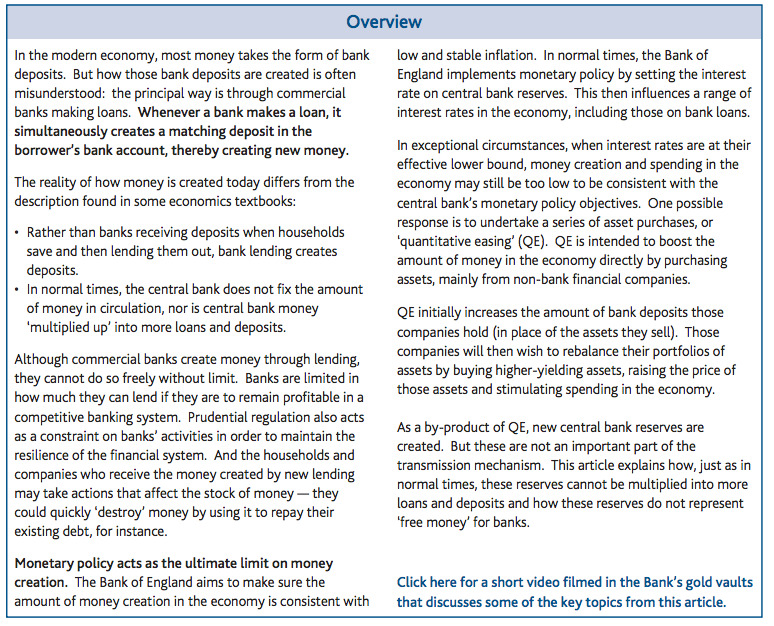 But still, most money creation comes from banks. The new talk is that banks should be banned from creating money, and that the government would take it over. Ever since the crisis, there’s been on ongoing discussion about how to make the financial system safer. The recent debate really kicked off when FT columnist Marin Wolf called for stripping banks of their right to create money. His argument was that allowing banks to create money ex-nihilo is what is responsible for destabilizing credit bubbles and busts. People expect that their money is safe, and so when banks make too many risky loans, the government is forced to step in and backstop everything. If the government is going to have to end up backstopping everything as it is, why not have the government be the source of money creation? Wolf wants banks to just be depository and payment institutions. Just straight up utilities without the ability to create money. As Amin Mian and Amir Sufi note on their blog House of Debt, the same idea (roughly) was recently advanced by Chicago economist John Cochrane (.pdf). That being said, the idea is extremely old. Mian and Sufi link to a 1939 proposal — spearheaded by the famous economist Irving Fisher — which sought to recreate a more stable banking system in the wake of the Great Depression. That paper spoke extensively about the need to prevent banks from creating money. 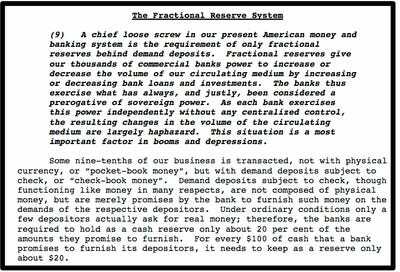 From that paper comes a stern warning about how the modern banking system is a “loose screw” in the American banking system, and that banks had too much power to create money. 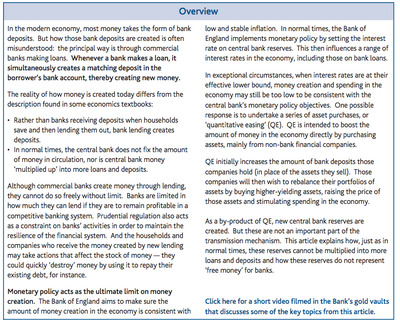 That paper explained that banks would still be able to act as lending intermediaries. For example, deposit accounts such as CDs (where the depositor was limited in how quickly they could get their money back) would be a legitimate source of loanable funds. In his paper on getting banks out of the creation of money, John Cochrane argues that banks could still be in the business of originating mortgages and loans, but that they could be financed by other authorities. Or there could be lending institutions that are 100% financed by equity and debt (not by deposits) thus insuring that those institutions not need a bailout. Our financial system is so unstable because the state first allowed it to create almost all the money in the economy and was then forced to insure it when performing that function. This is a giant hole at the heart of our market economies. It could be closed by separating the provision of money, rightly a function of the state, from the provision of finance, a function of the private sector. This will not happen now. But remember the possibility. When the next crisis comes — and it surely will — we need to be ready. There are also some big objections to the idea. In a blog post titled Is A Banking Ban The Answer? Paul Krugman points out one big problem with Wolf’s piece, which is that what might happen is simply more financial activity happening outside the banking system, into the less regulated shadow banking system. Krugman also raises questions of complexity, and whether the problem runs even deeper than financial stability (given that financial stability was restored in fairly short order once the government decided to make that a priority). The IMF did a report in 2012 on the 1939 Chicago Plan, which is useful background reading. 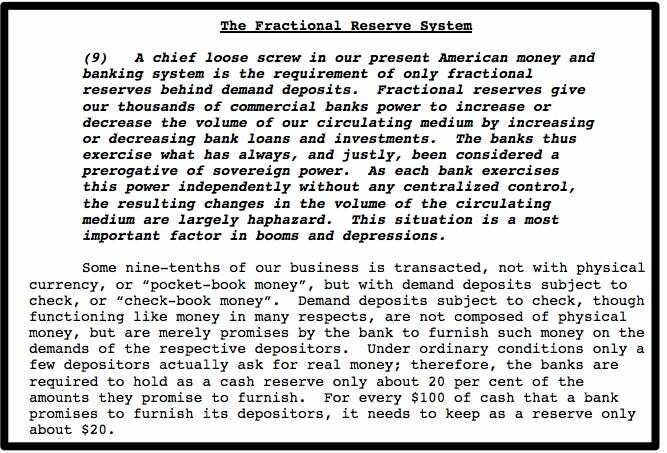 Matthew Klein also wrote a great piece for Bloomberg View last year on killing banking as we know it by imposing 100% capital requirements (ending fractional reserve banking). Again, this isn’t going to happen, but it’s useful when thinking about the nature of money to realise that money creation is something that’s been outsourced to the banks, and that to have the government be the prime creator of money would be radical departure from the current system.